An eight mile stretch of U.S. Highway 70 between mile marker 162 and 170 was identified as one of the four most critical areas in regards to wildlife-vehicle collision. A study is now being conducted that will help find the most popular wildlife crossing areas on Highway 70 and ultimately reduce fatal accidents, thanks to a House Joint Memorial that was passed by the New Mexico Legislature in 2003. Photo credit: Courtesy Image-Marron and Associates, Inc. The eight-mile stretch of road seen here has been reported to be one of the four most critical areas in regards to wildlife-vehicle collisions. A study is being conducted that will determine the most heavily populated areas in regards to wildlife in order to propose a solution to reduce collisions. Marron and Associates Inc. has been contracted by the New Mexico Department of Transportation to conduct the detailed study. According to Heather Parmeter, a biologist for the company, the purpose of the study is primarily to seek out the most heavily populated wildlife areas through an analysis of data. Once the key areas are determined, a plan will be proposed to help improve the main stretch of road for both commuters and wildlife. Knight said the study has looked at data that dates as far back as the early 90s. The data consists of police reports, eye witness accounts, and surveys. A new survey is currently available on the NMDOT website, where commuters can report accidents or animals they have spotted on the eight mile stretch of road. Knight said they have also surveyed the entire stretch of Highway 70 to look for wildlife skeletal remains as an indication of popular animal crossing areas. Cristina Rodden, WSMR Wildlife Biologist, has been working closely with the biologist from Marron to provide any information necessary to conduct a successful study. 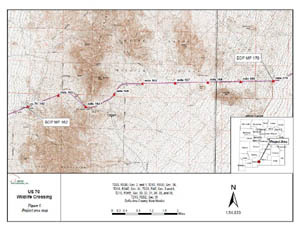 Rodden said it is because of the highway’s stark rating that WSMR feels it is important to cooperate with NMDOT projects which will lead to future improvement projects. “It is very important for WSMR commuters to spend the time to participate in the online survey to assist NMDOT in making the highway safer for them and wildlife,” Rodden said. Parmeter said surveys will be accepted until July 31. If an accident is witnessed after the survey deadline but prior to September 1, the survey will still be available for reporting. Please visit http://dot.state.nm.us/ProjectsD1.html#CN-3964 and click on ‘U.S. 70 Wildlife Questionnaire’ to take the survey.